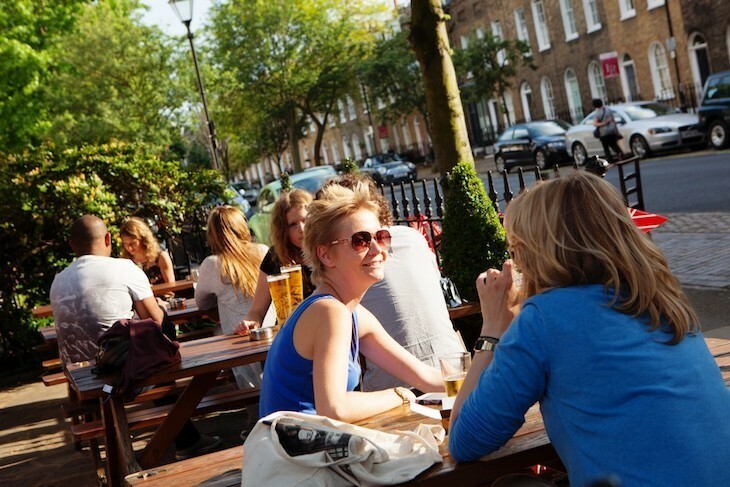 Sitting outdoors with a good, honest pint is one of the timeless joys of London. 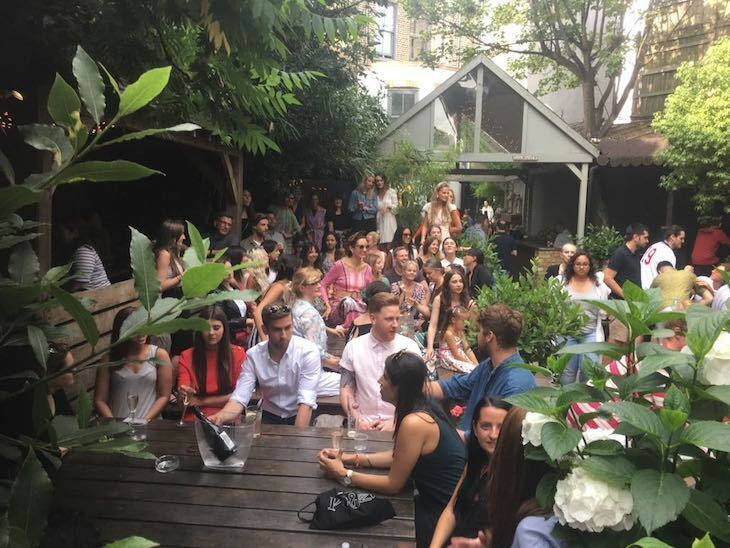 Fortunately, our city is blessed with hundreds of al fresco drinking spaces, from tiny roof terraces to sprawling gardens. Land value being what it is, you're most likely to find the bigger, more verdant types the further out you go, although there are plenty of beauties in the inner suburbs. And here's a teaser: can anyone think of a zone 1 beer garden with grass? Our map below is a work in progress. It shows recommendations from Londonist readers, as well as the many places we've personally enjoyed. 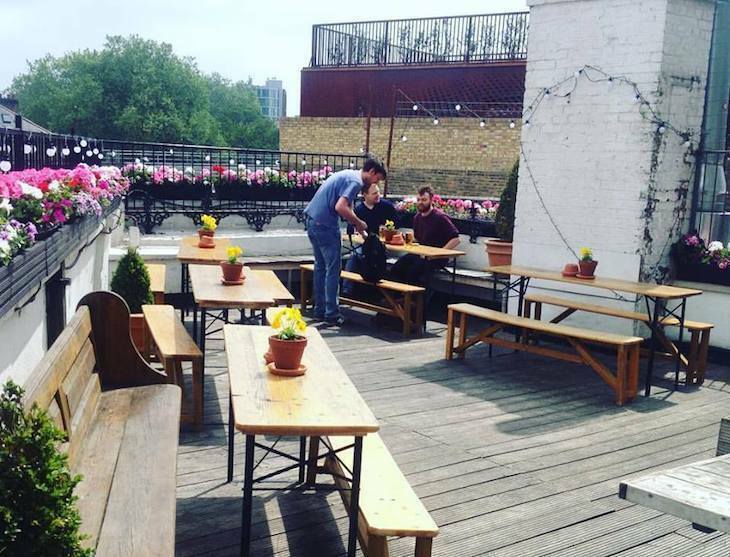 We've included any pub with a sectioned-off open space, including small roof terraces. But it has to be towards the pub end of the drinking spectrum, rather than chain bars and clubs. 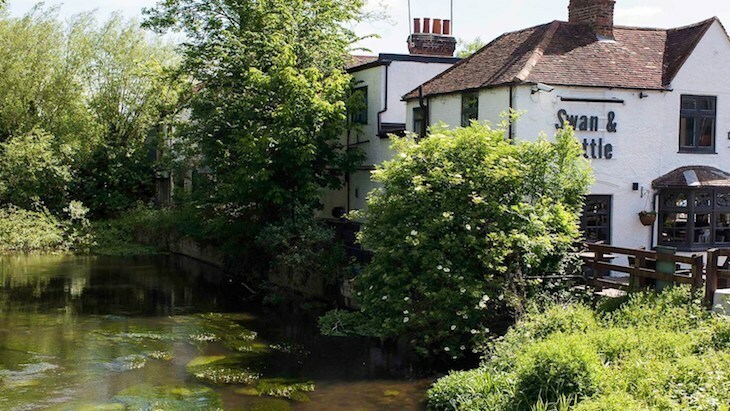 Traditional pub grub is served up in this canal-side boozer. Watch the boats putter by. Harvester boozer with all the pub classics and an outside space. A Beefeater pub with a huge sea of green, studded with oversize umbrellas. 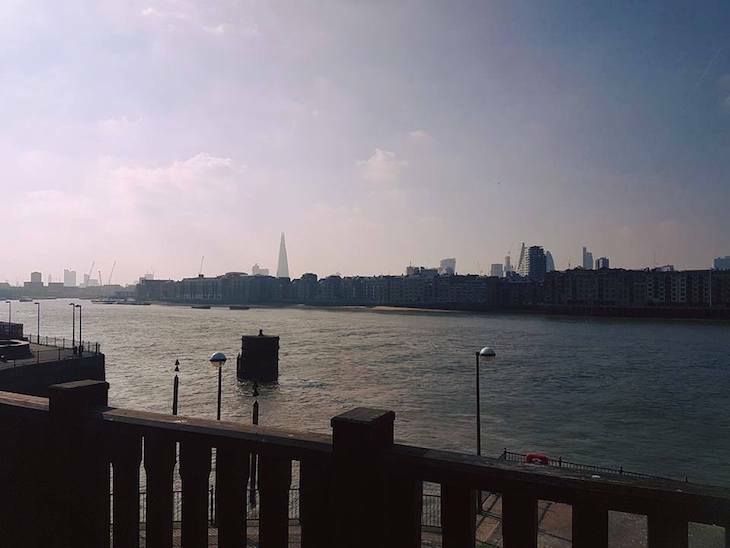 Big old famous neighbourhood pub that offers amazing views of the river from its beer garden. Victorian pub with a great view overlooking the Thames. Part of the fun is visiting at high tide, when part of the garden sits underwater. Bavarian beerhouse with lovely Thames-side views. 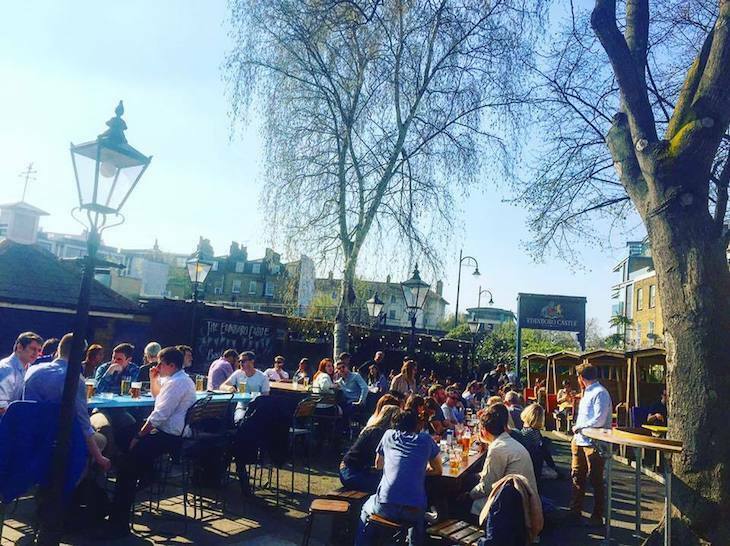 Sizeable beer garden, we reckon one of the best in London. 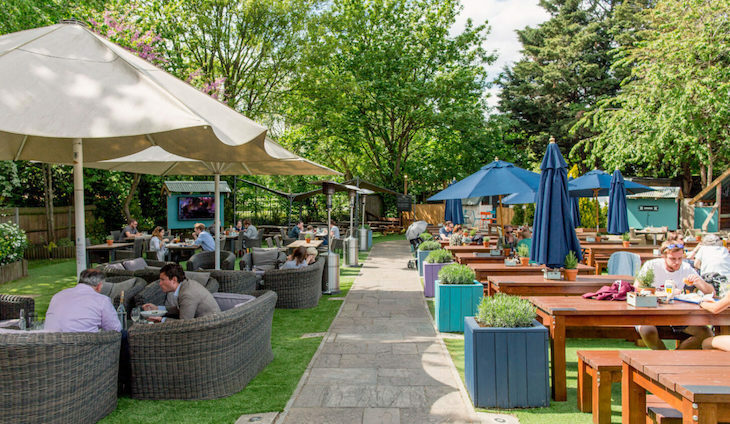 This gastropub has a stunning view of Kew Gardens, with a garden out the back with benches and private wooden 'pods'. 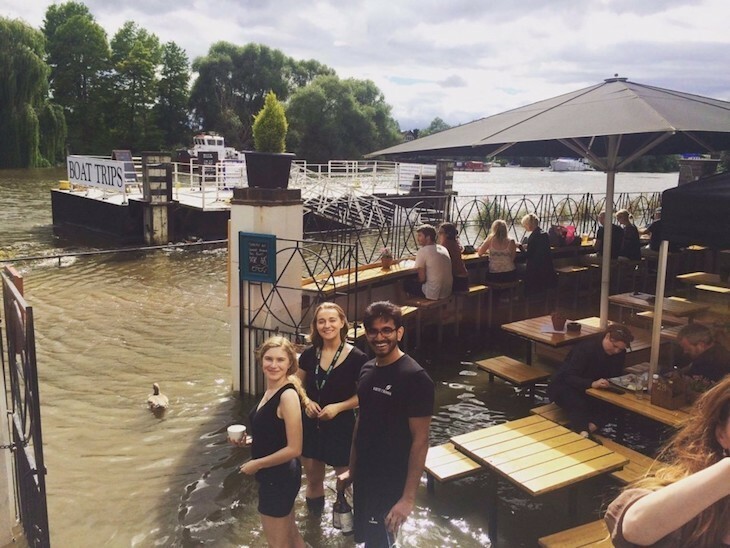 The front beer terrace is regularly surrounded by water at high tide, so watch out. 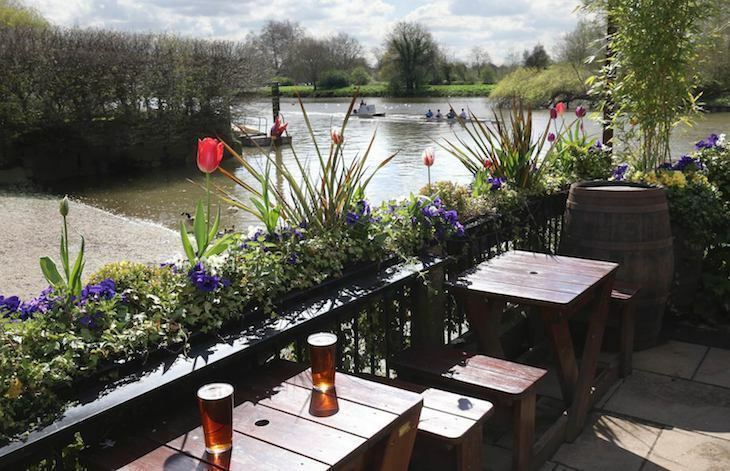 It's in our list of best pubs on the river Thames. Traditional English pub, with no jukebox, fruit machines or pool table in sight. It has a lovely, well-manicured garden with patio. The lawn is, however, out of bounds, as it was traditionally a bowling green. 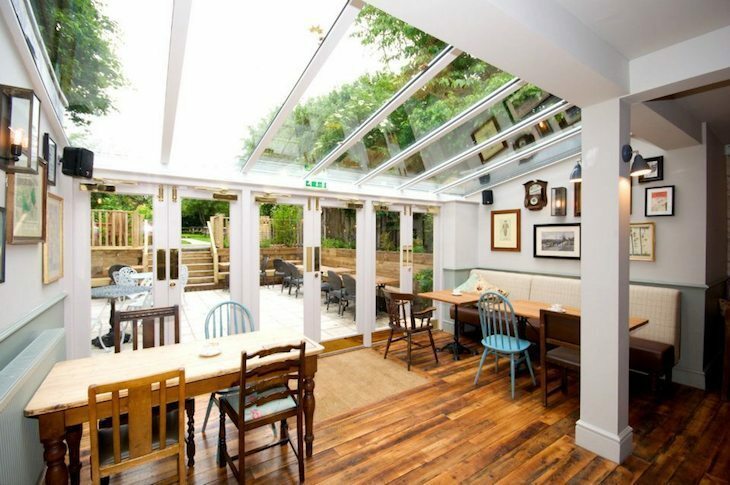 18th-century Fuller's pub located right on a leafy towpath, with a conservatory and restaurant. Victorian pub with beautiful wide windows. Beautiful garden. Tapas recommended. A huge beer garden with bonus benches right out on the river too. 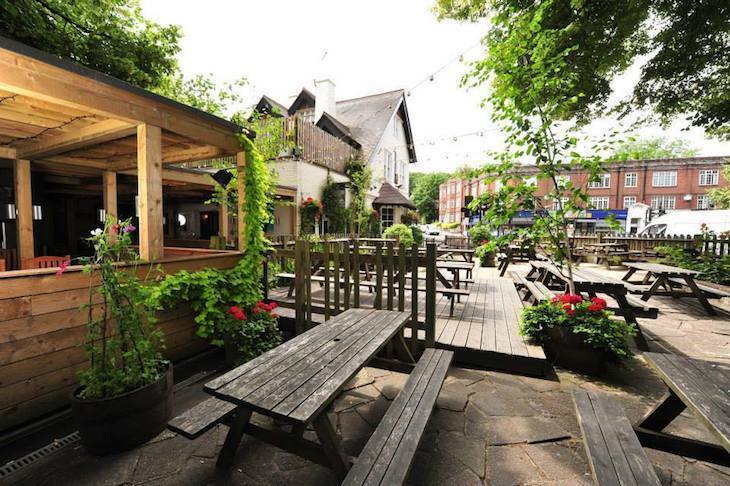 Tucked-away pub with a relaxing, leafy garden. Fuller's pub with huge beer garden. Voted the best in Ealing by Londonist readers. This is old boozer meets smart gastro pub with a bamboo-like tunnel that protects you from the elements. Friendly neighbourhood pub with colourful hanging baskets and a large beer garden with benches. 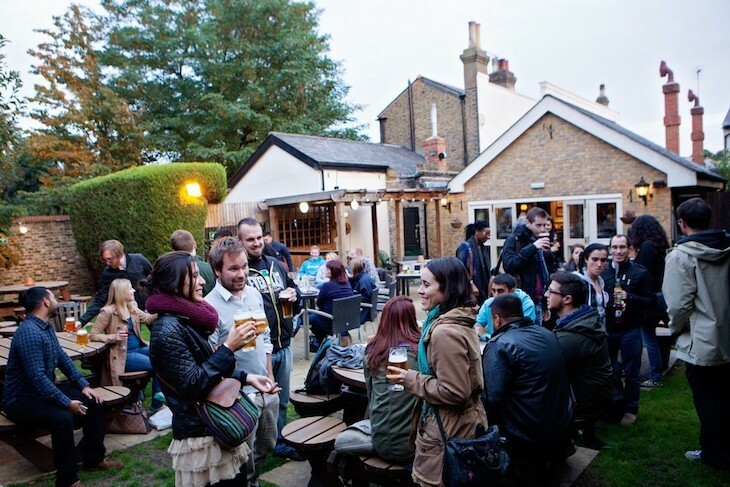 Voted one of the best pubs in Ealing by Londonist readers, with a large walled garden – heated in winter. A neighbourhood local with a large, colourful beer garden. 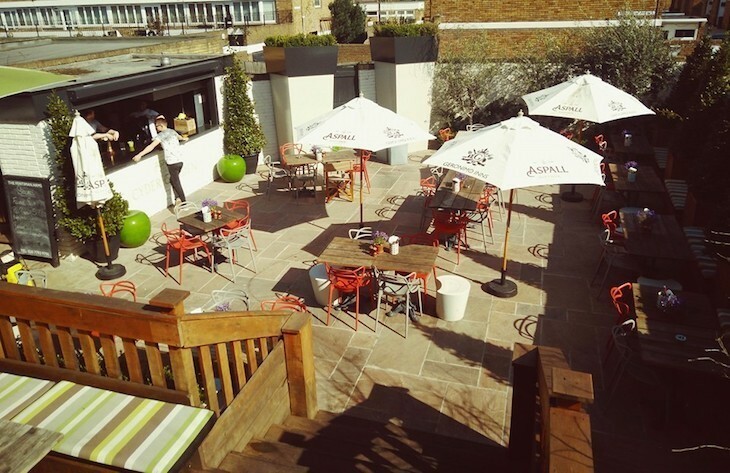 This local gastro pub has a roof terrace and one of West London’s largest beer gardens. Refurbed old boozer with real ale and a beer garden with an outside bar. With a vibrant yellow exterior and a 'secret' little garden out the back. 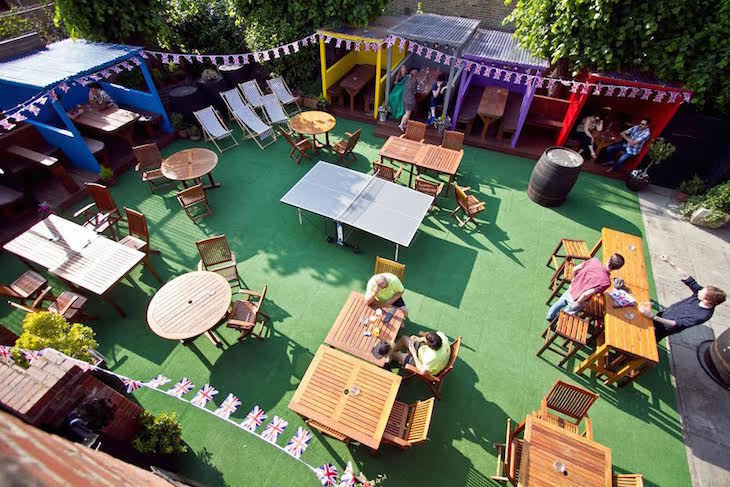 A smart gastropub and relaxing garden, with faux grass and colourful deckchairs in the garden. 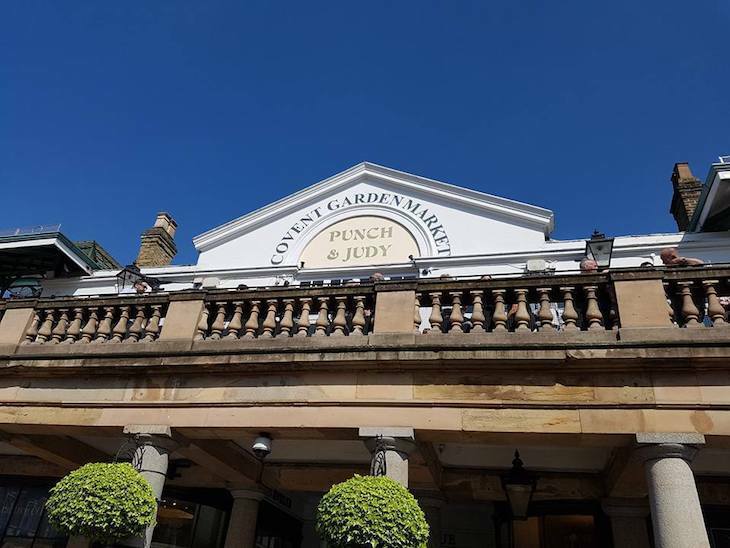 Around the corner from the Sipsmith Distillery, so expect to get stuck into the G&Ts. An airy pub with a log fire, conservatory and a beer garden. 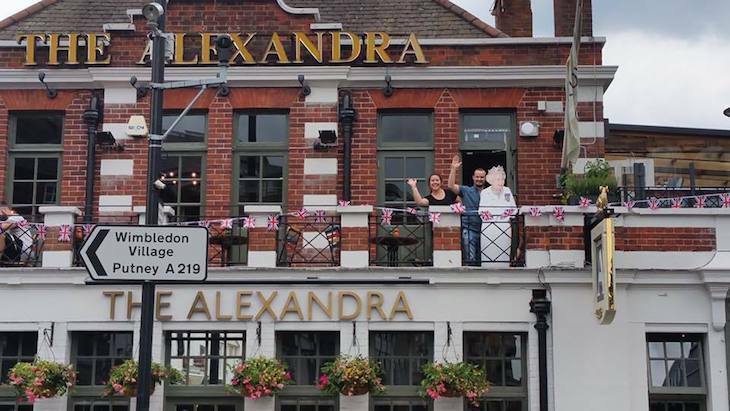 This renowned Hammersmith pub is located right on the river. Palm trees and colourful flowers in this tropical-looking beer garden. Chilled secluded garden and good beer. A huge, inviting oasis of trees and cold beer on warm evenings. Nestled in one of London’s leafiest areas. There's a big beer garden with wendy houses, outdoor games and parasols. Overlooking the famous Barnes village pond, with a beer garden and bowling green. Decked pub garden filled with trees and sunshine. Bonus points for being just a short walk from the Thames. A great little pub with real ales and a green beer garden. Smart venue, with a tidy seating area. Known for its barbecue and sunny beer garden. Great beer too. 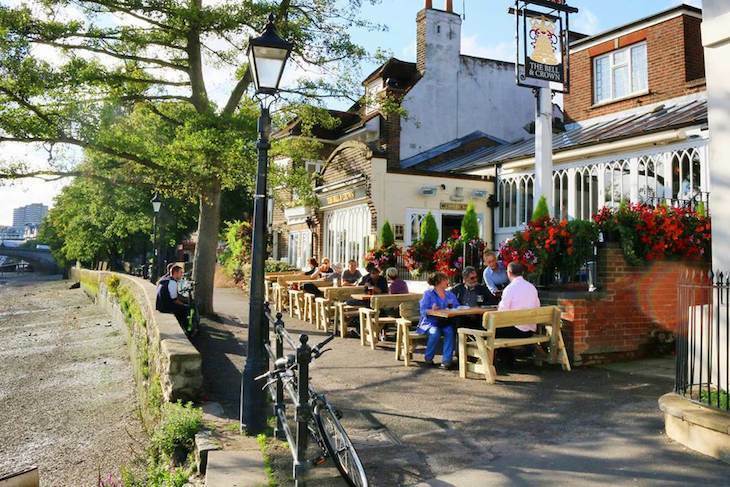 A pretty well-to-do pub in a pretty well-to-do area, with sweeping Thames views. Great Thames views – expect busy times during the summer months. 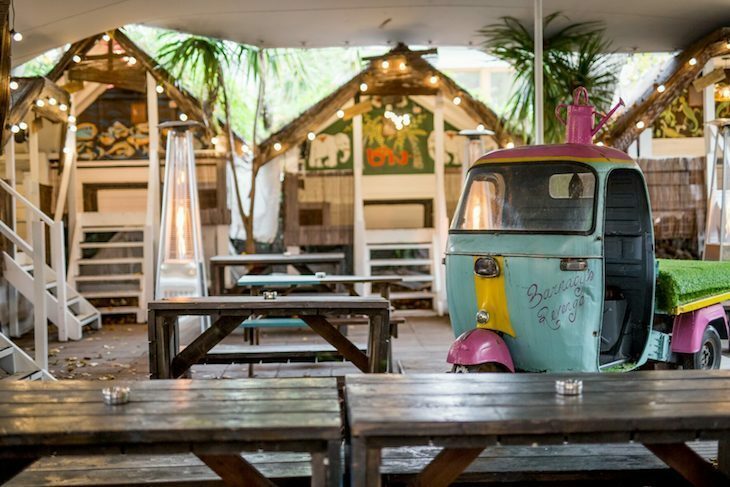 Hippy-style pub garden that looks like an eclectic al fresco living room. What this smart gastropub lacks in character, it makes up for in patio-ed beer garden. The likes of Jimi Hendrix have played at this renowned Chelsea pub. There's a café downstairs and a little garden at the back, enveloped in trellises and trees. 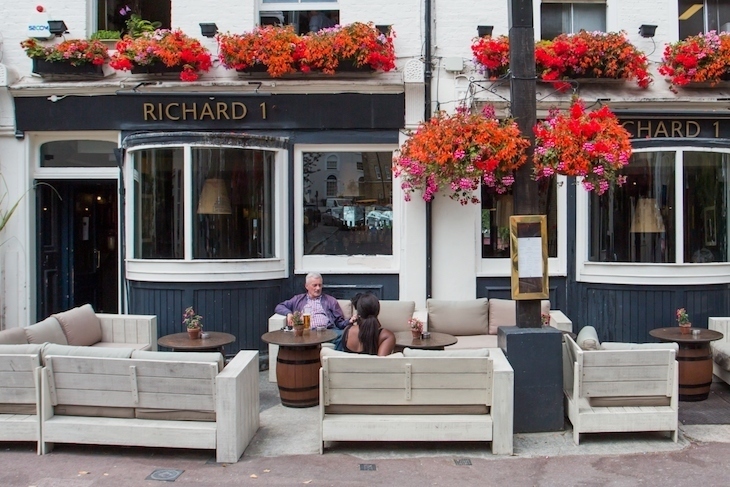 This SW3 pub prides itself on its swanky garden — soft furnishings and all. 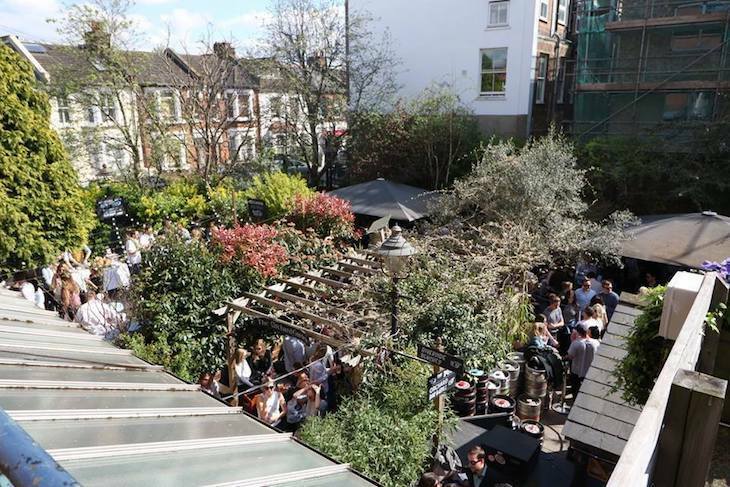 Located just off the King's Road, this Chelsea pub has Victorian features, craft beers and a beer garden. 19th-century cottage on the edge of Wimbledon Common, with a garden-like back yard with calming green views. 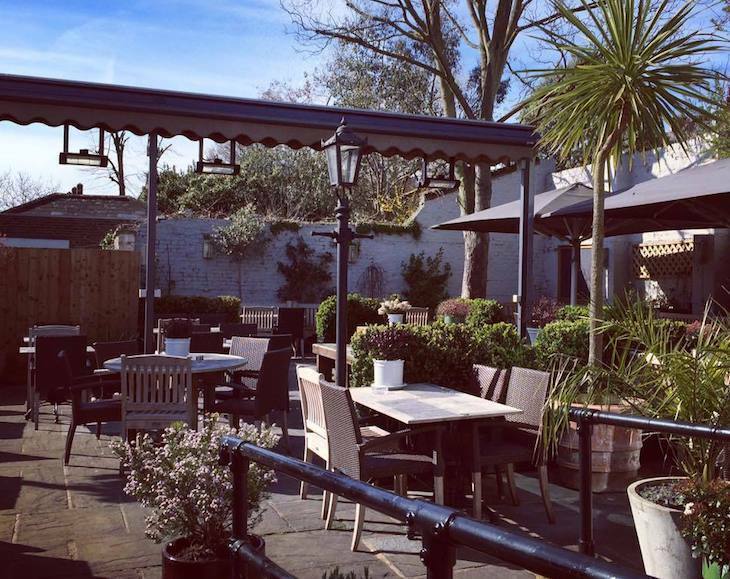 A Wimbledon pub with a cosy patio-ed beer garden. Good old-fashioned pub with a spacious terrace and a balcony out the front. Red-brick pub with real ales and a walled garden. True to its name, the garden here really is something, wood decked and extensive, and beautifully fairy-lit at night. A tremendous 16th century inn with the feel of a village pub and a garden, complete with a stone kiln. Beautiful garden and a wonderful, traditional pub. Nice back garden, along with a decent selection of beverages, and a Thai restaurant in the same building if you're peckish. Smart neighbourhood pub with a covered terrace. 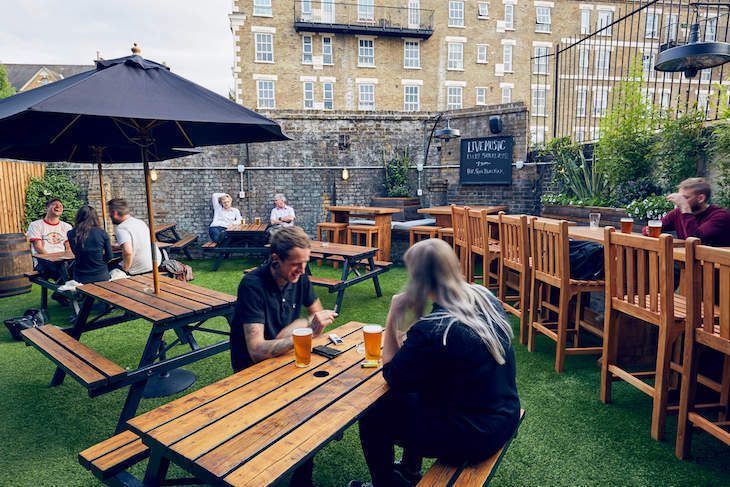 This pub garden makes you feel like you've just taken a stroll to a countryside pub — a great city escape. 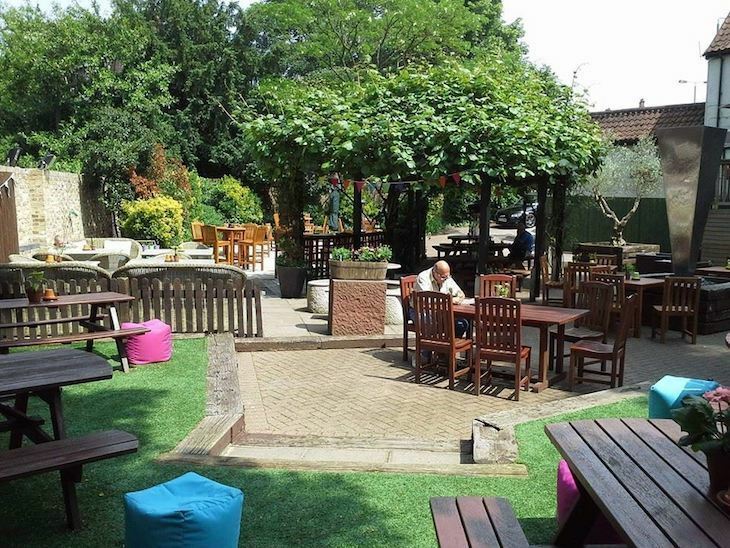 Family friendly, great beer and lots of space in this lovely local's beer garden. 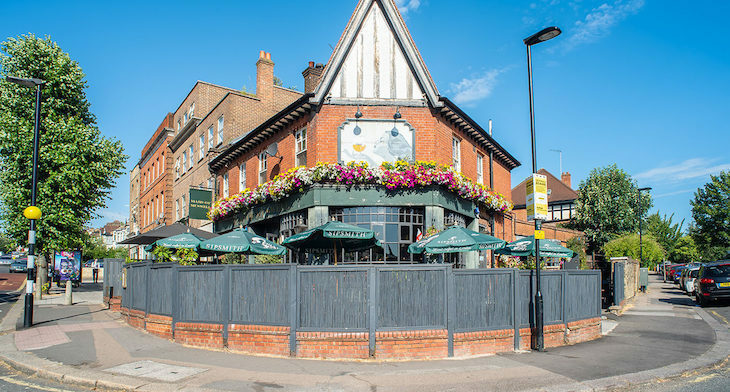 A popular Kentish Town pub, with a conservatory and beer garden. 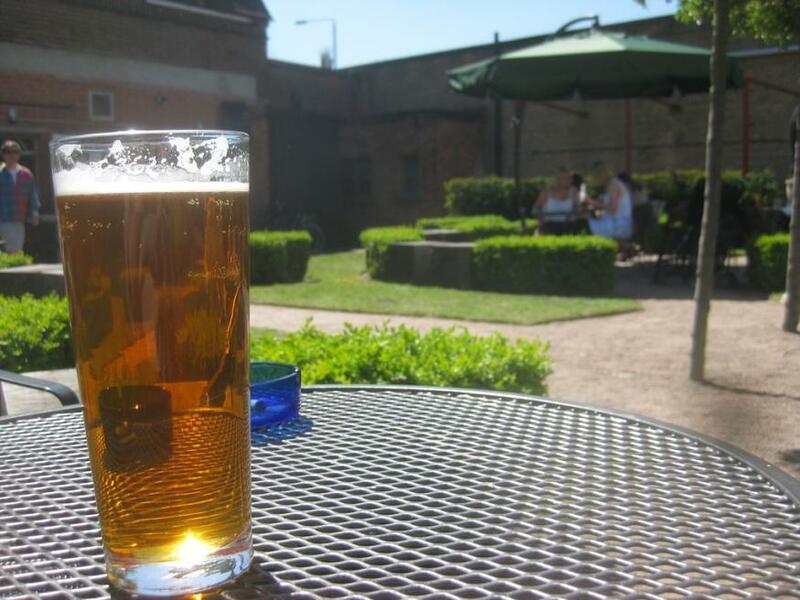 A large Victorian building with an airy conservatory and a buzzing beer garden. 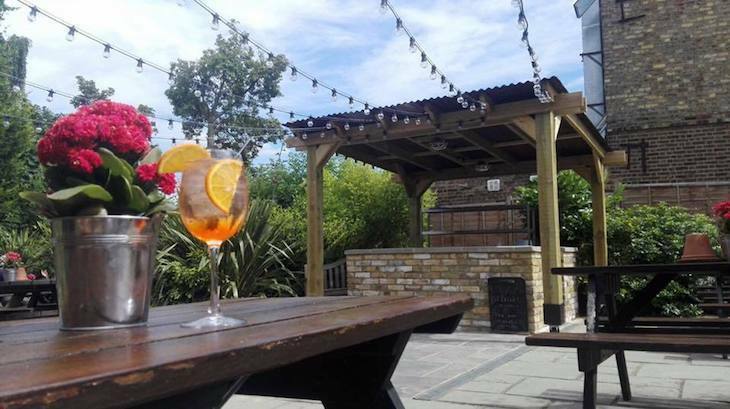 A great summer spot, with a large roof terrace and beer garden. Not a huge garden, but a decent enough suntrap. Huge beer garden with plenty of benches, but on sunny days can get very busy. An autographed rock star hall, a small garden and bonus roof terrace. Based in leafy Primrose Hill with a walled garden. Buzzing lock side pub with a rooftop drinking area overlooking Camden Market. This pub has a rare basement garden, which has/had a fake Banksy. Has a small terrace area — but be warned — it's often full. 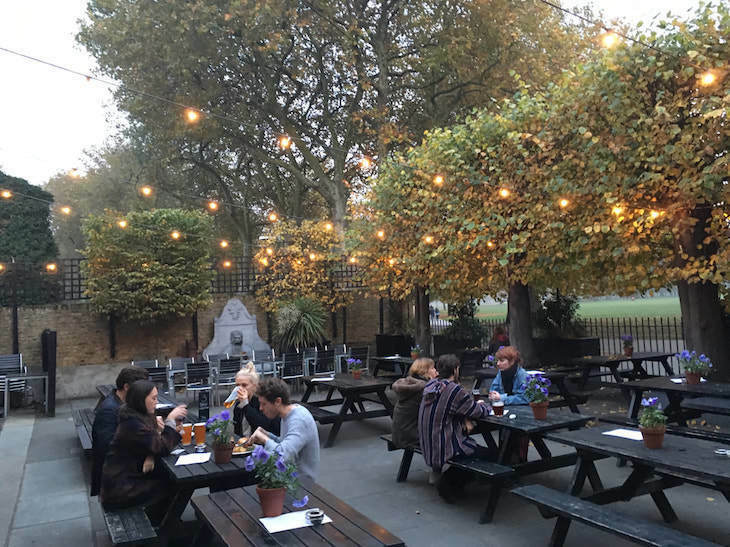 Previously The Stoke Newington Tea House, and before that the Daniel Defoe — The Clarence Tavern retains its large terrace beer garden. Friendly neighbourhood pub with a beer garden and Sunday lunches. Lively Irish boozer with pot plant-studded garden. A veritable Ewok's Village of a beer garden. Family run pub specialising in ales and whiskies. Paved, but nice garden. The roof terrace here is a nice sun trap. Georgian pub with an extensive garden. 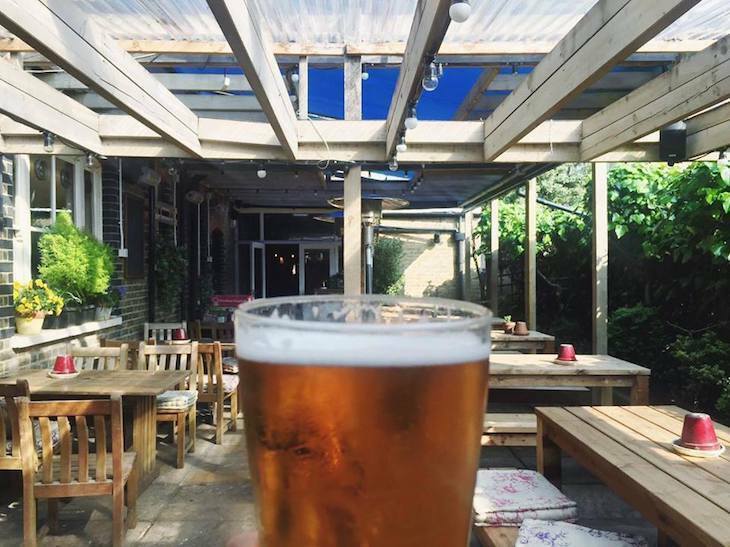 Located just off Regent's Canal, with a menu matched to one of 20 craft beers. 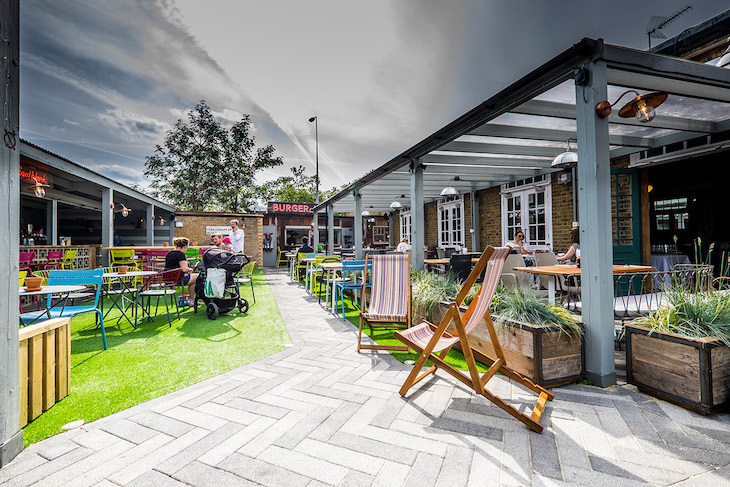 Pretty, landscaped garden filled with picnic benches and tables for al fresco dining from the outdoor Burger Shack. Gastropub with a nice little courtyard garden. This hotel/pub has a neat little garden out the back, with a mix of chunky picnic benches, elegant garden sets and a leafy green wall. 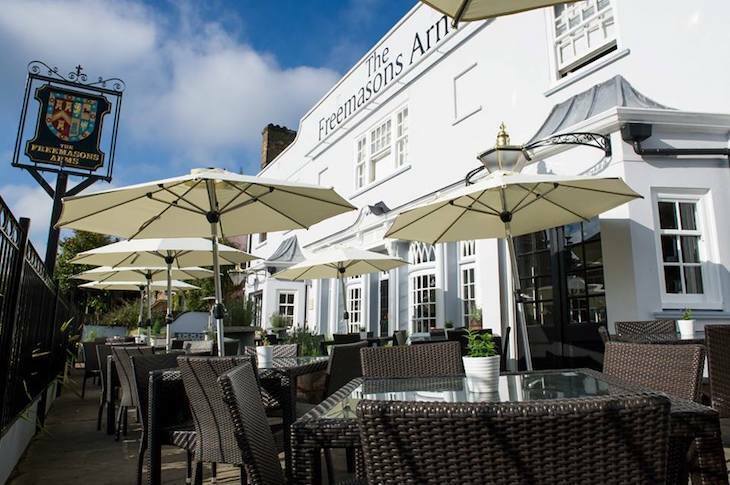 This smart Hampstead pub looks like a country house, with an airy conservatory and an opulent beer garden. This wood-panelled 19th-century pub has a popular, large, heated garden. 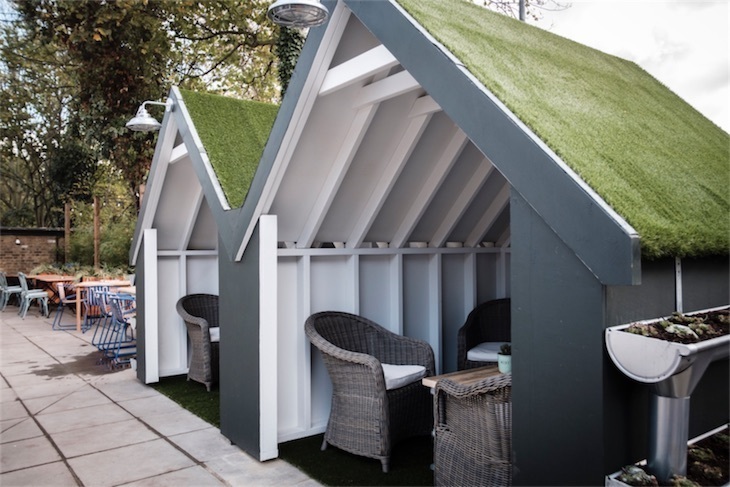 Around since 1874, this Hampstead gastropub has private cabanas in the back garden. A green garden offering al fresco dining. A shady garden which sometimes does hog roasts in the summer. With preserved Victorian features and a partly covered area at the front of the pub. Trendy pub with a small outdoor decking area. One of the largest gardens in Highgate, with both covered, decked patios and al fresco benches. 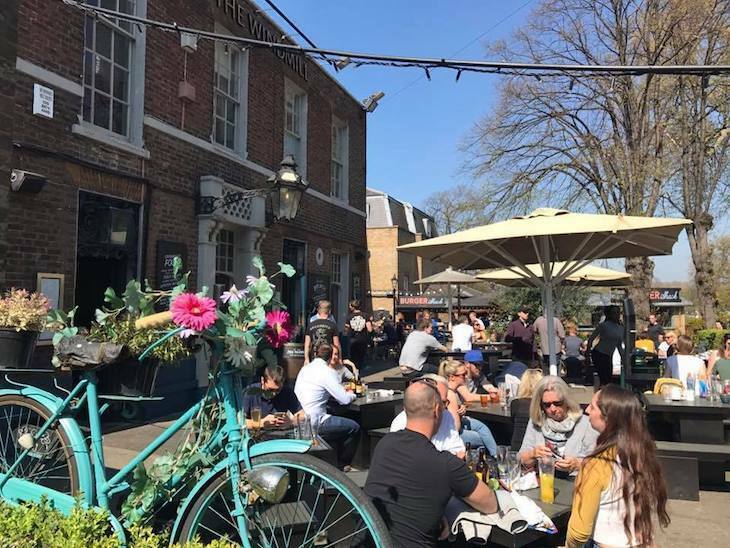 Sitting on the edge of Wandsworth Common, a refurbed Victorian building-turned pub with a large sun drenched garden, with small tables, family benches and parasols. Dreamy. 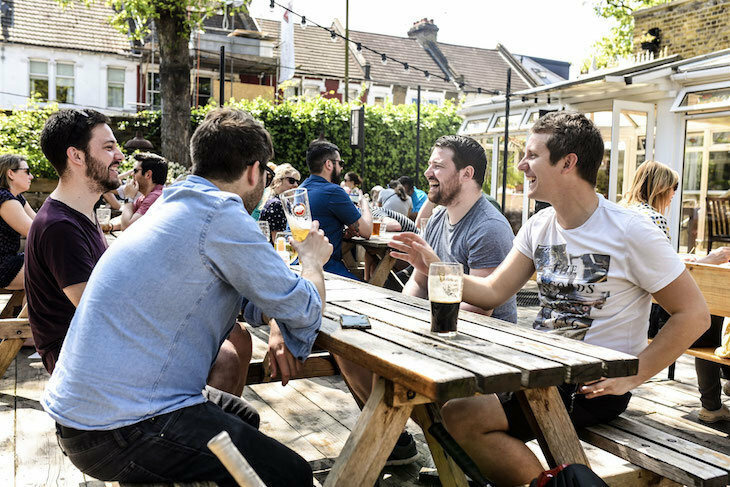 Lurking between Clapham and Balham — this gastro pub sure pulls in a crowd. Boasting three outdoor spaces — a roadside terrace, a secluded courtyard, and a large back garden with its very own bar. Beers with a view of Wandworth Common. Dog-friendly. Built in 1853, this cottage-style pub is steeped in character. The garden features a charcoal barbecue. 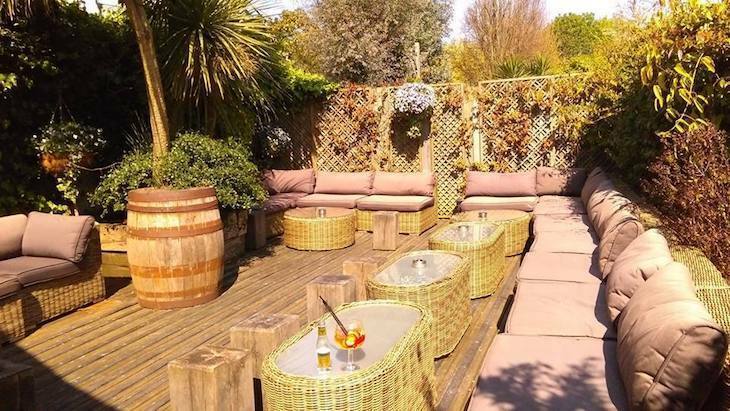 This 'Secret' bar garden is one of the biggest in Balham — head here for al fresco dinners and barbecues. 300 year-old pub with an immense beer garden, beach huts and outdoor games. Now has a restaurant in the refurbished garage in its spacious and sunny yard. With Sunday roasts, a fireplace and a quiz night. Large lawn and decking area. Quaint, friendly local with a no frills beer garden. 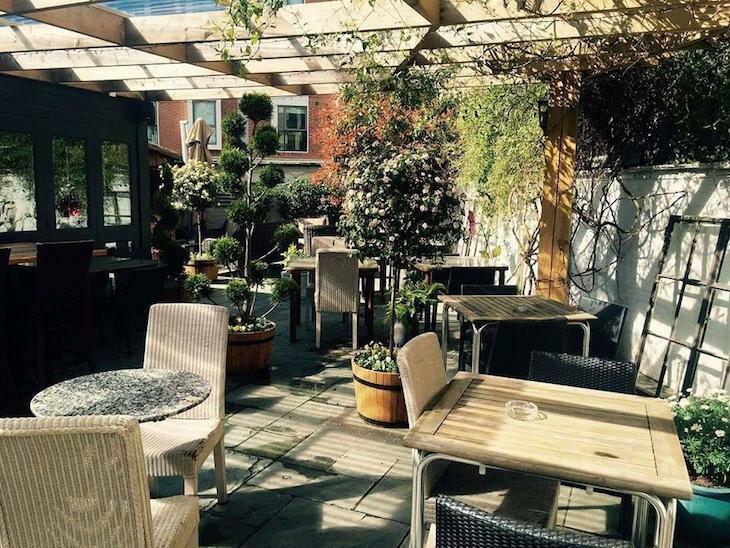 Deep sofas, decent beers and a pretty courtyard garden out back that's a little bit of a sun trap. 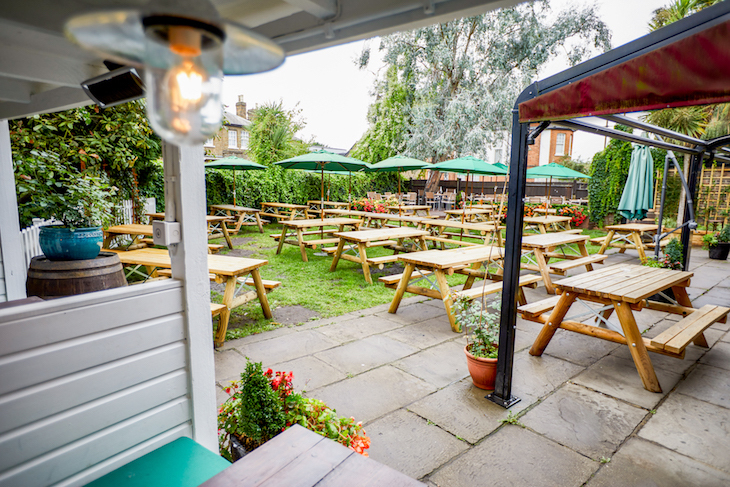 Renovated a few years back, The Bull is home to a sizeable pub garden filled with plenty of seats and colourful sheds available for private hire. A courtyard, large decked garden and mini-orchard, all at the rear of the pub. Traditional-looking pub, with a beer garden and live sports shown on big screens inside. Beautiful, spacious garden and patio area. This country-style pub is always bustling on the weekend. It's got a spacious conservatory and generous garden located right on Clapham Common. Trendy craft beer pub with food pop ups and a small terrace at the front. 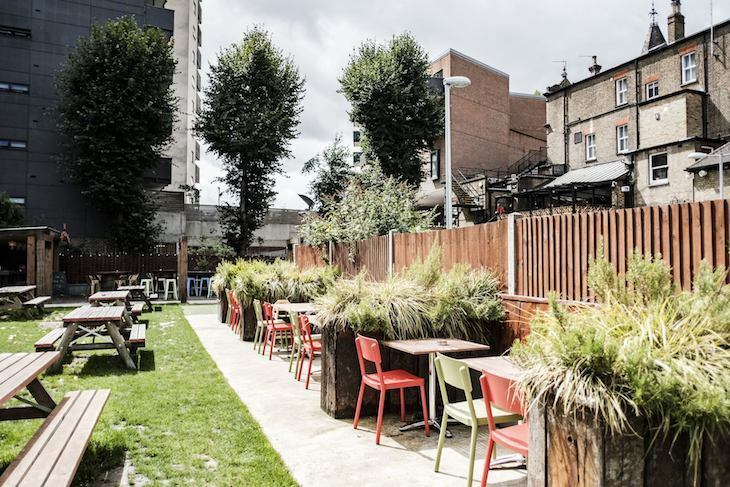 Verging more on bar territory, but this is (we reckon) one of the best beer gardens in Brixton. It's huge, with a campfire and a circle of tiki huts you can book out individually. 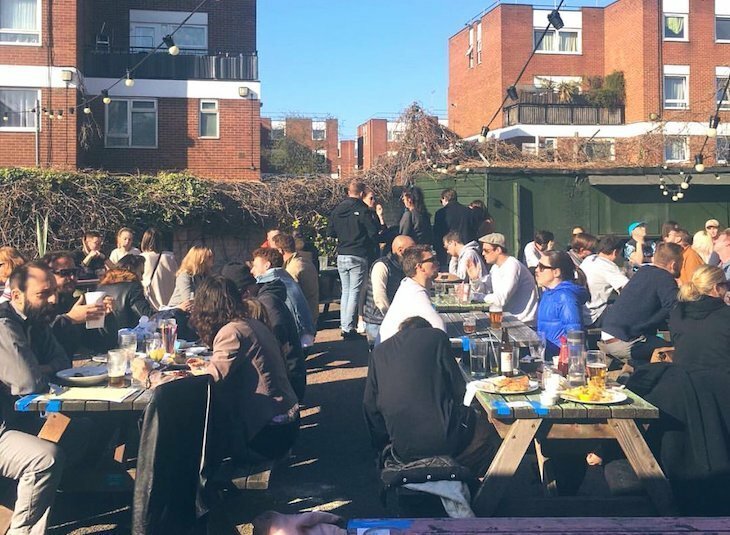 Voted by Londonist readers as one of the best pubs in Brixton, with a handsome interior and healthy-sized beer garden — they call it 'hidden', but we say, not very. 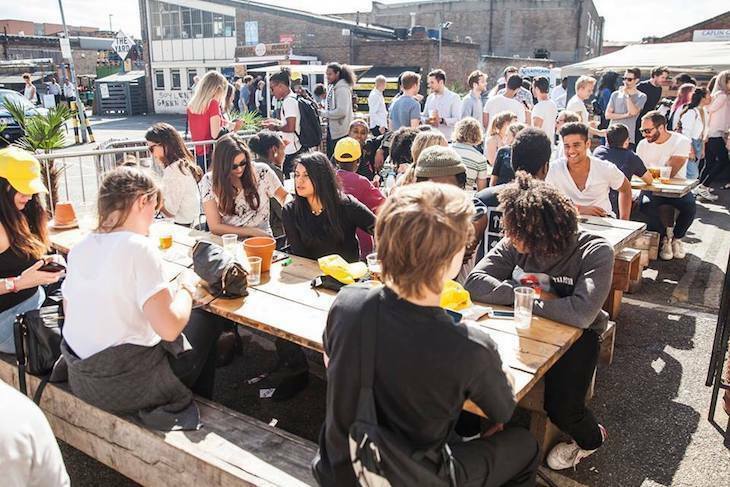 A popular choice amongst Brixtonites, with a huuuuuge garden with a Glastonbury-esque feel — hay on the ground, fell tree benches and an outside kitchen. Out the back you'll find yourself in a tropical(ish) paradise. Or hang around in the front garden and watch the Clapham wildlife. 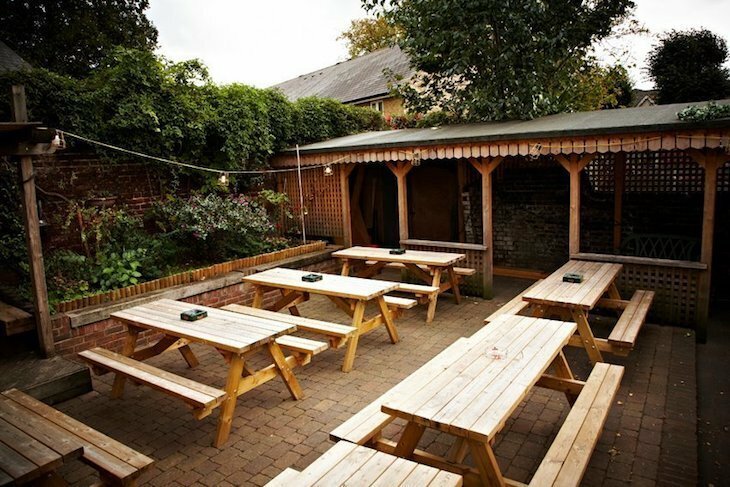 Clean cut pub with a bushy beer garden hosting al fresco parties in the summer. Set up in an old factory with canal-side drinking and pizza. Huge beer tanks behind the bar and plenty of sun-drenched benches outside. If there's any sun. 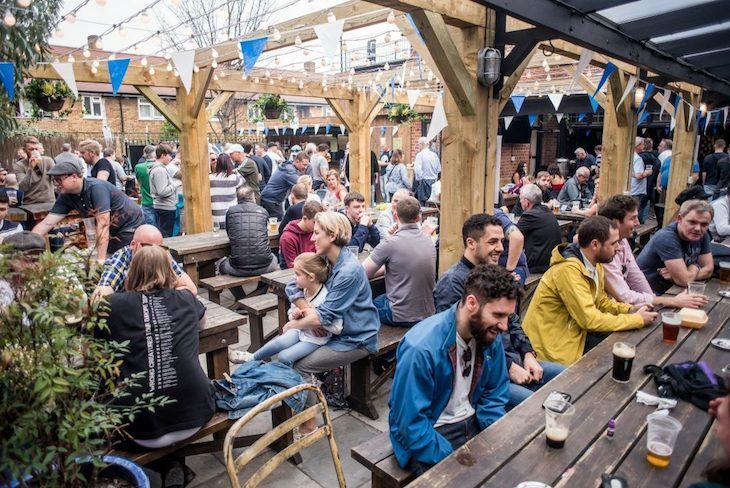 Shabby chic London boozer with ales, British food — great beer garden with graffitied walls and table football under a covered area. Local pub with a walled garden. 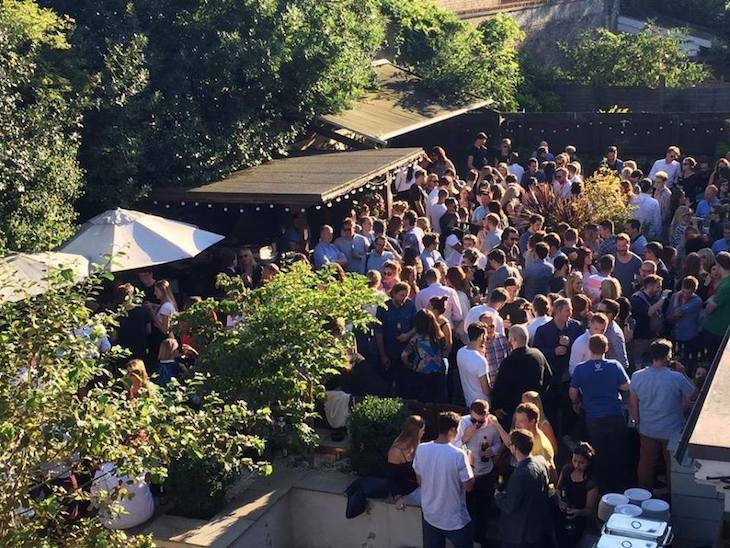 Nice, cosy back garden with live DJs outside in the summer. 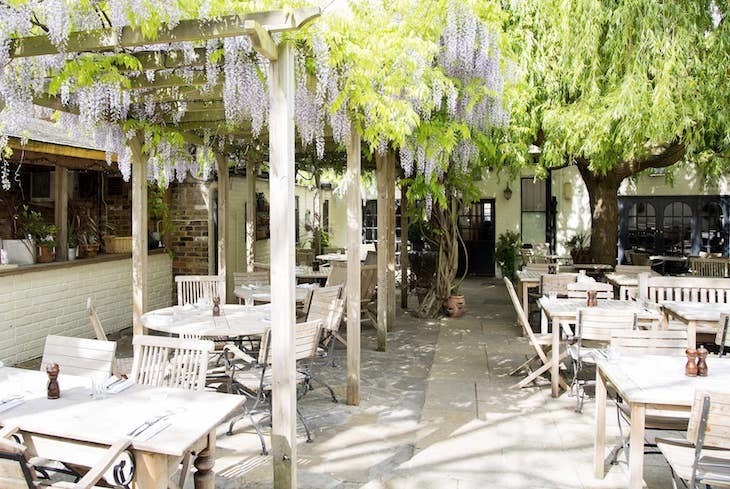 There's a conservatory and generous beer garden within this former 19th-century coaching inn. A cosy pub with benches outside. Plant yourself down. 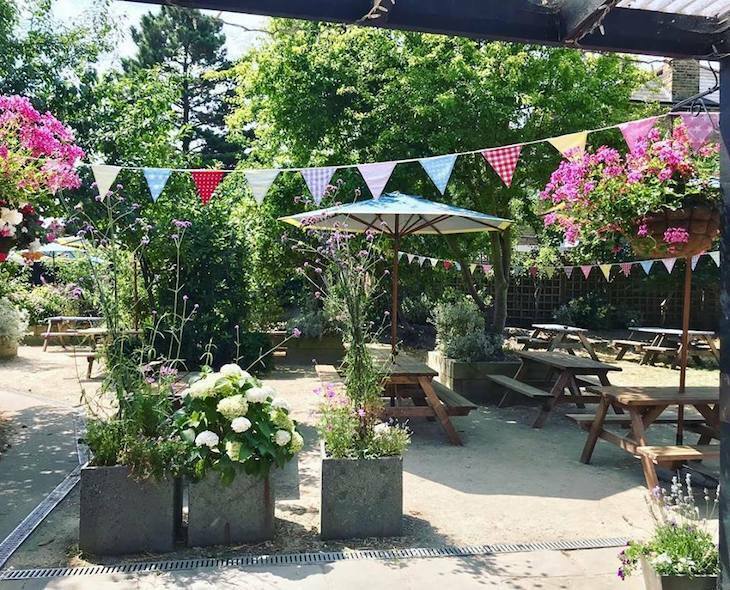 This rural pub sits on the edge of Hackney and Leyton, with views of the River Lea from one side, and large areas of parkland on the other. A city escape in the city. 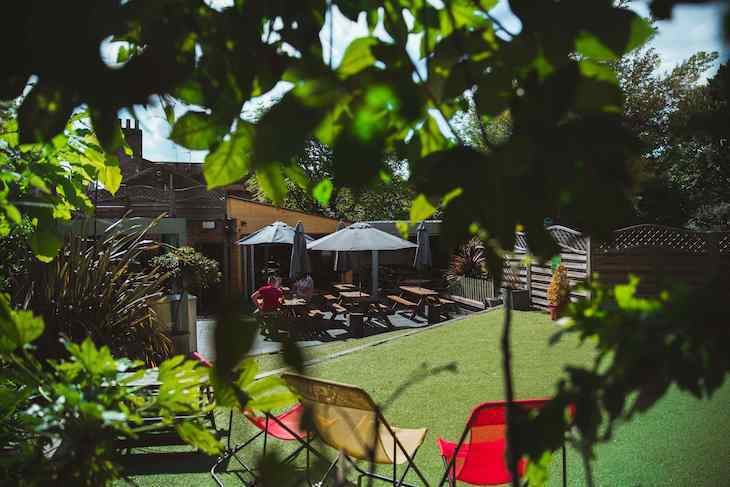 This Clapton gem has a nicely sized beer garden, with sheltered huts and outside screens so you can catch the game and some rays. Winner. Steeped in history, this magnificent place has a small beer garden. 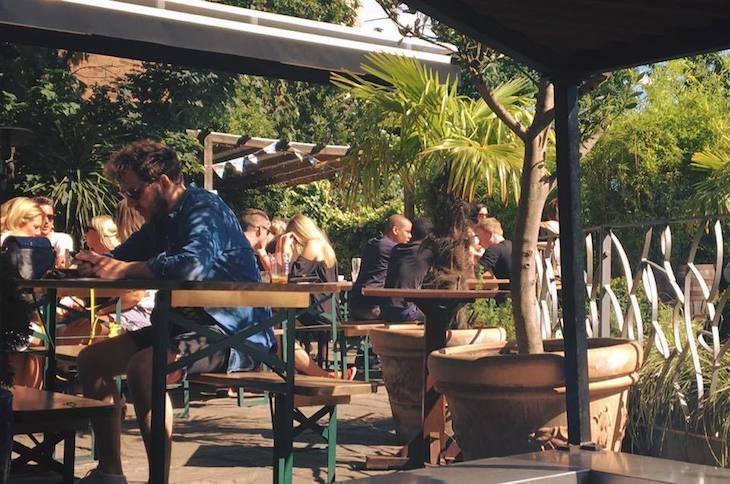 Like it says on the tin, located right on the edge of London Fields, this is the perfect summer drinking/ partying spot, with a huge park-sided beer garden, with boules — plus dancing and DJs inside on the weekends. Recently renovated east end boozer (formerly The Misty Moon) with an enclosed beer garden. If all the studied tattiness isn't your thing, there's a slightly more polished anteroom and a pretty big beer garden out the back. 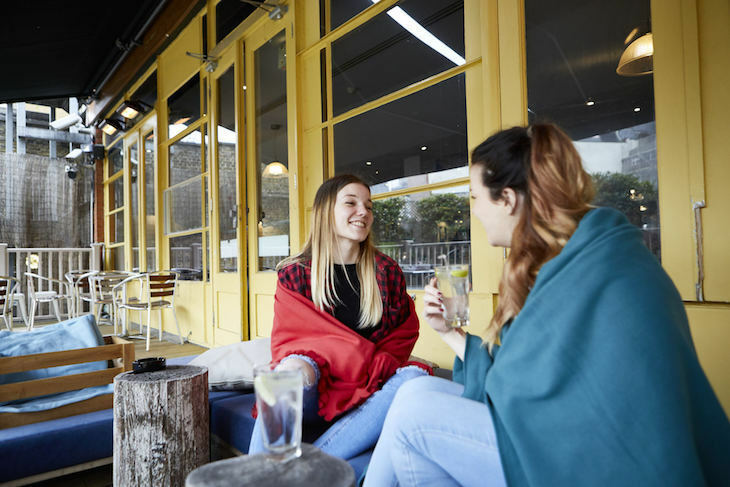 Set in the heart of Brick Lane, it’s nice and airy with lots of large windows, world wide beers and a tiny terrace tucked out behind some backrooms. Cracking rooftop seating area, but you have to carry your pint all the way up. Don't try when you're tipsy. With cask ales and a roof terrace. Has a surprisingly large beer garden. Seating around the front and the back, plus a little balcony upstairs too. 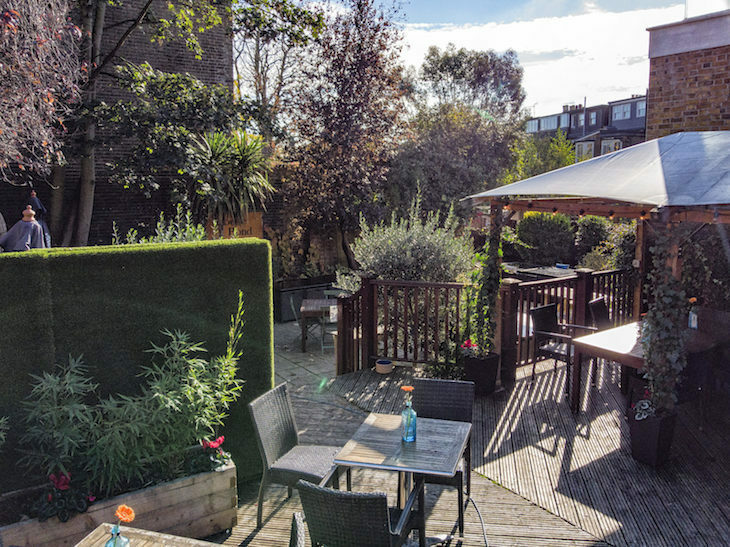 Grab a craft beer and head out to the ivy-clad garden out the back, with its own lamppost. Smart city pub with a front drinking area. Another riverside pub vying for the ‘Oldest Pub on The Thames’ title. With a tiny Thames-side terrace. This ship-like riverside pub claims to be the oldest pub on The Thames — where James II's famous Hanging Judge was captured back in the 17th century. 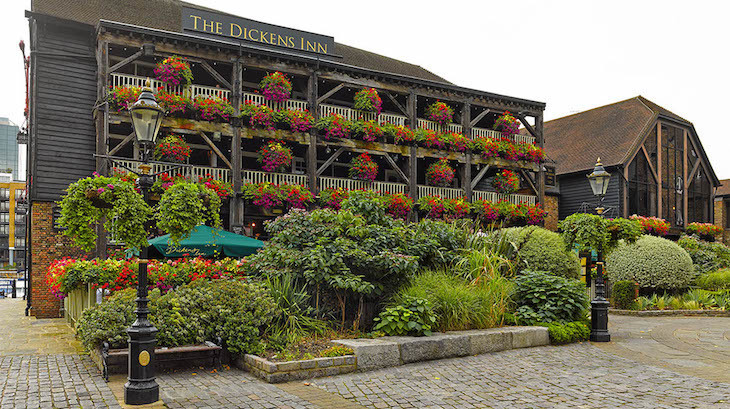 With a great location at the heart of St Katharine's Dock, this waterside pub boasts tiered balconies, hanging flower baskets and, blissfully, not a car in sight. This old warehouse has large windows overlooking The Thames — plus a large yard downstairs right by the river. One of London's most famous pubs, from the 1520s. With a sought-out drinking terrace out the back. Located right on the river. Boom! There are better pubs in the area, but this is one of the few with a beer garden at the back. Modern pub with a roof terrace area — rare for this part of town. Has a pleasant courtyard space. 18th century pub with a roof terrace overlooking the piazza. Wood-panelled pub with a small roof terrace. 19th-century Bloomsbury pub with real ales and a nice little back terrace. Named after the 300 year old boat race (oldest in the world) that hits The Thames every July. with summer barbecues in the beer garden out the back. The riverside views says it all. One of central London's biggest beer gardens, although new development means it's sadly in the shade most times. Great split level beer garden with covered decking for when it rains, patio heaters for when it's cold, and trees giving natural shade for when its sunny. No beer garden as such, but you're allowed to take your drinks onto the grass of the square. Apparently, it's 'amazeballs'. 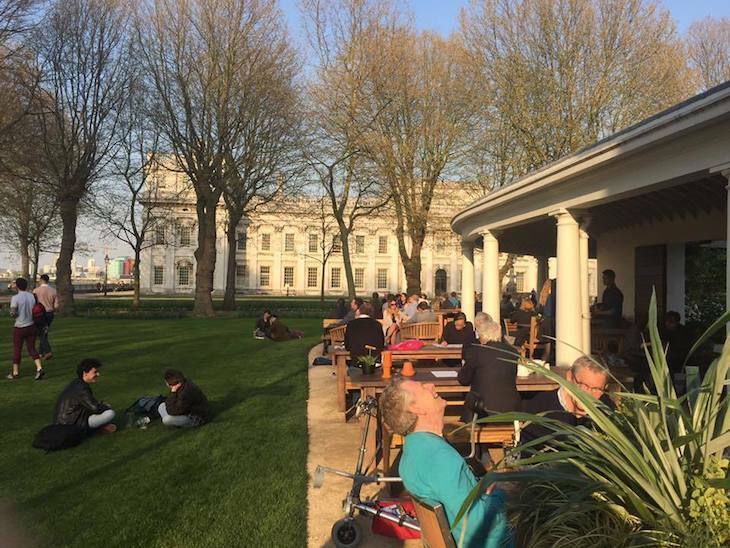 Popular tourist pub with riverside beer garden, plus roof terrace. Raised seating area overlooking the river. With a concreted drinking area to side of pub. 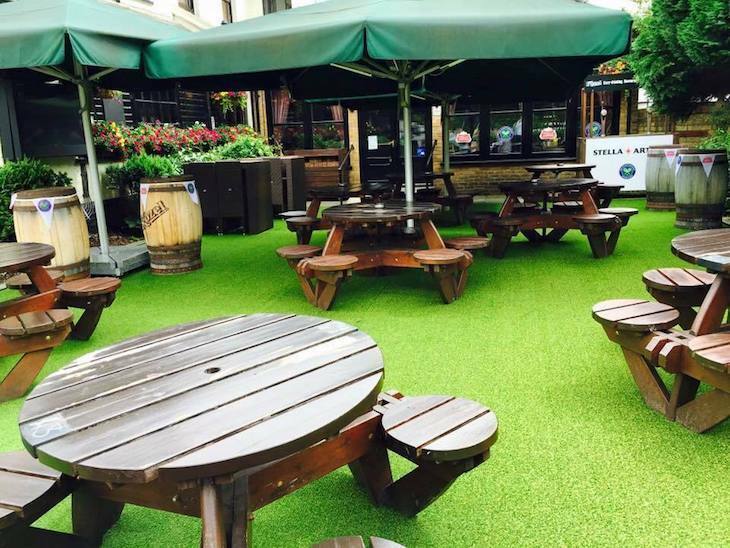 The yard is given over to seating at this historic pub. 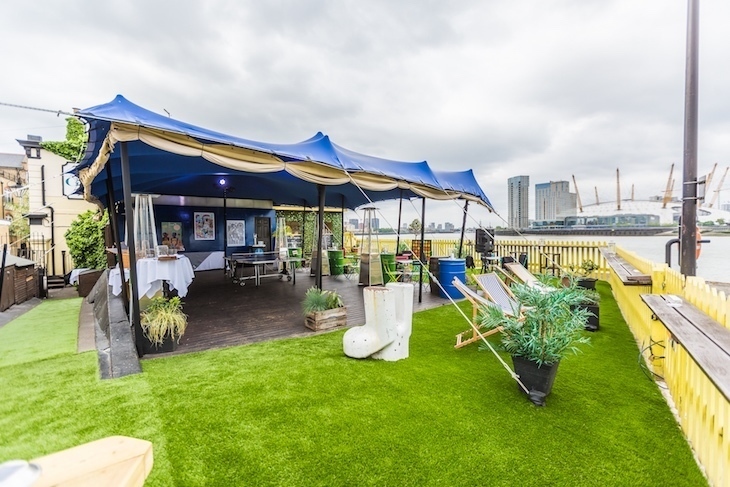 This former tea warehouse offers riverside drinking with good view of the City. A narrow little pub with a nice little garden out the back. Trendy pub with a garden in the front and back. 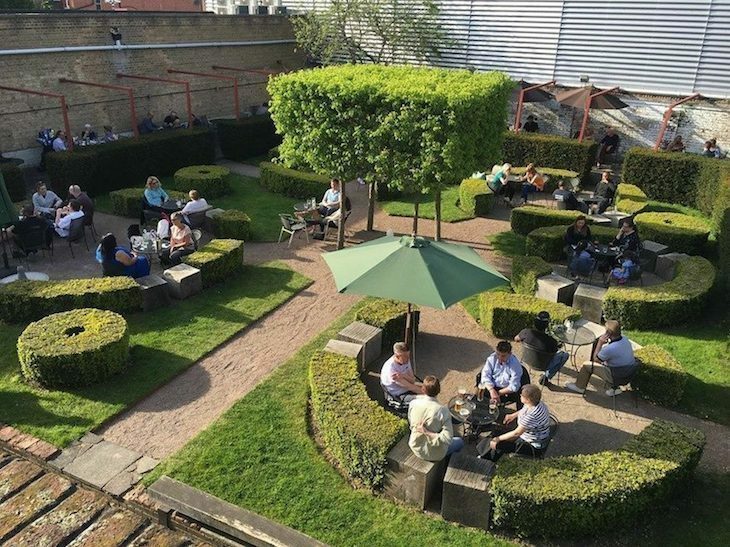 This Wetherspoon hosts a large garden on a slope. Okay… yes bar — but it’s pretty epic. On top of multistorey car park, with vast city views, this makes for a killer sunset spot. Only open through summer. 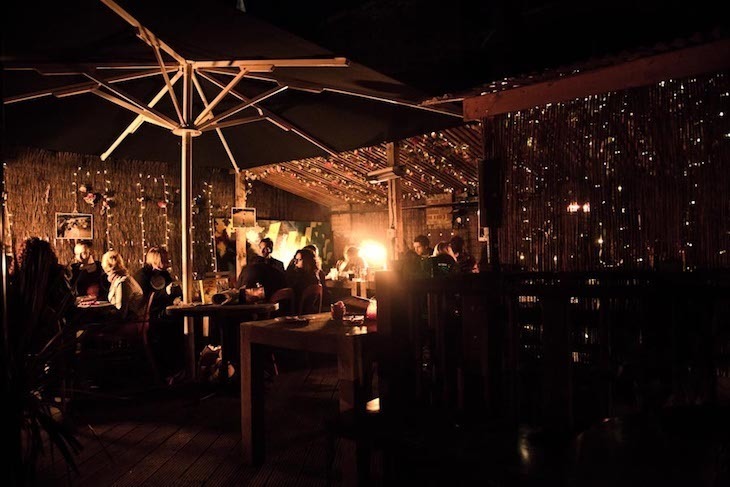 Arty venue with flowing cocktails and a rustic outdoor space, with fires to keep you going through the evening. Lovely green garden that's part deck, part grass. Has table tennis. Spacious local with a decked beer garden. Upmarket bar with a decked garden. Large pub with a conservatory, outdoor decked area and barbecues in the summer. A true pub 'garden', filled with flowers, fruit trees and herb planters (and a couple of very happy bees during the summer months, too). 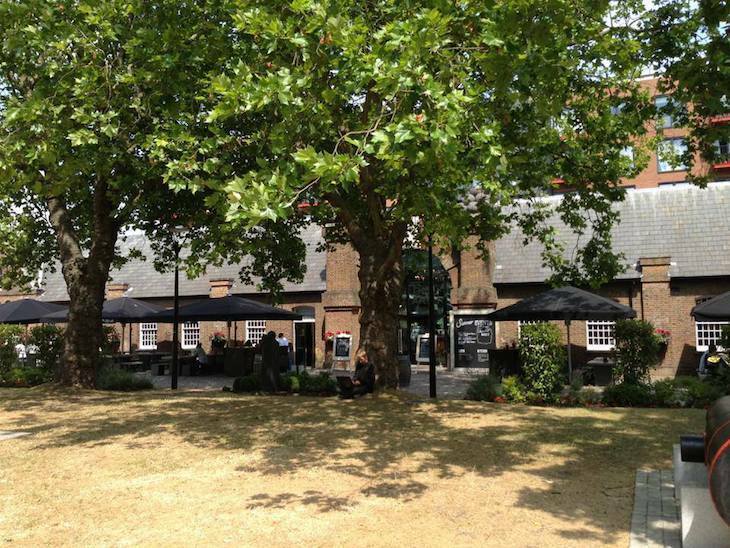 There's a huge beer garden at this former coaching inn. 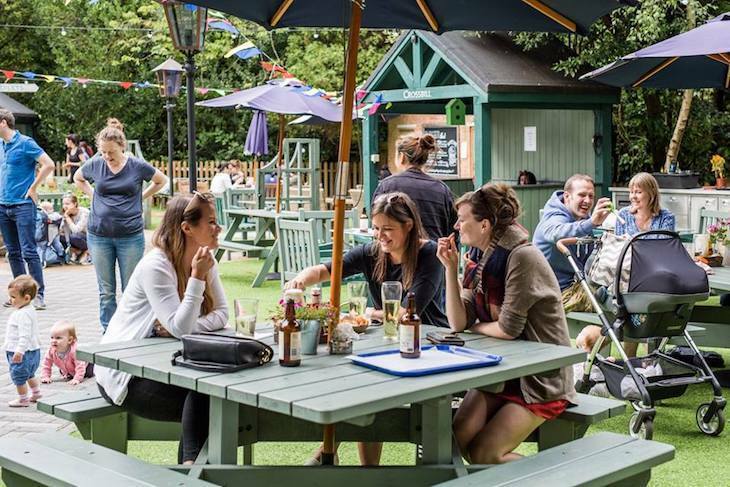 A smart pub in leafy Dulwich with a smartly preened beer garden with cute wooden huts. A two-tiered beer garden — heck yes! Georgian pub with guest beers and sports. Spacious lawned beer garden with preened hedges, it feels a bit like a scene out of Alice In Wonderland (if you forget about the brick walls behind you). Modern bar with a beer garden and Sky sports. Excellent ales and a massive garden out back. The tavern has had a makeover; now it's all about top quality wine, acoustic live music. It still has that nice little beer garden with wooden benches. Serving up real ales and a sunny courtyard. A great local pub with real character. 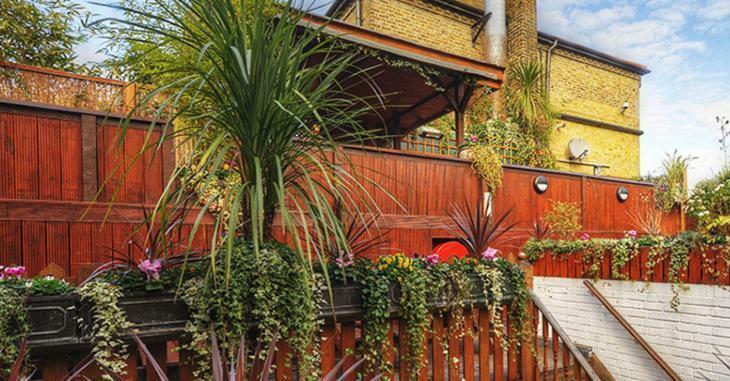 This Victorian pub has a part-covered and heated garden. A friendly local 'old man's pub'. A local pub with a roof terrace and board games for the winter months. Classic British pub, with craft ales, wood panelled walls and a beer garden with live chickens (yes indeed). This local pub is middle class all the way, with a lunchtime mums and babies club and a lawned garden. Over 200 years old, and full of (tasteful) nauticalia, this pub comes with a great riverside terrace. 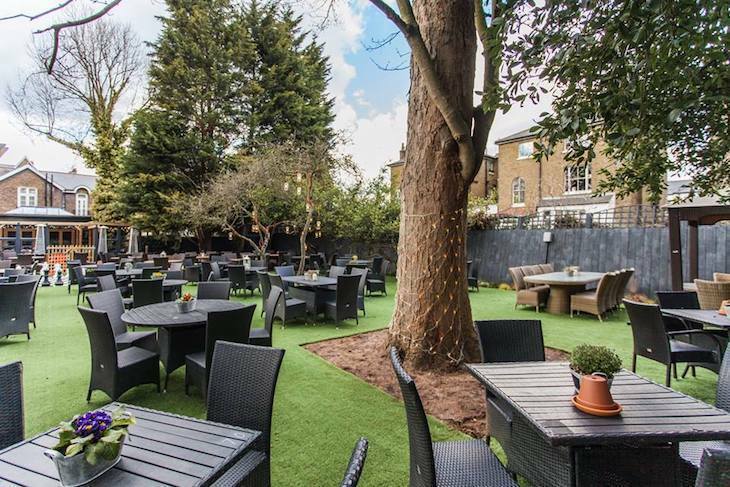 This Greenwich gastropub serves seasonal British food, decent beers and boasts a nice outdoor terrace. This small pub has a very decent patio garden with retractable roof. With streetside seating and a large beer garden, heated in the winter. With a sunken decked beer garden. Lots of tables out front so you can sit in the sun, but often people sit on the grassy square that Dial Arch borders.